Dog grooming involves bathing, drying and brushing a dog, as well as clippings and trimmings. Why should you take your dog to a professional groomer, like D’Tails Grooming of Augusta, Georgia? There are several reasons. First, professional groomers have “all the right tools” to do their job. 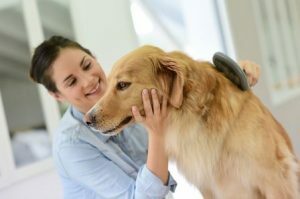 From scissors to razors, clippers to shampoos, and then some, groomers are well-stocked with the equipment, tools and products needed to get a dog clean and healthier than when they came in the door. Groomers have the ability to get rid of skunk smell, as well as ticks and fleas. Moreover, when it comes to styling different breeds, who better than someone who does that sort of thing, every day, for a living, right? Because professional groomers work with a wide variety of dogs on a daily basis, they become very skilled at handling dogs and their behaviors. Sometimes you might have a pet dog that seems anxious or aggressive. Or, perhaps your dog is older. For some reason, like the aforementioned ones, your pet dog might post a challenge if and when you try to groom him or her at home, on your own. However, the professional groomer seems to have “ways” to interact with your “challenging” dog that miraculously “work,” and that amazes you– hey, that’s their trade, and they’re great at it. Furthermore, groomers can do the heavy lifting required to physically adjust the dog during grooming, which can be especially helpful if you have health problems yourself, like back pain or arthritis. Another nice thing about professional dog groomers is their willingness to work with your schedule. Typically, you can agree upon a time and place and, in most cases, drop your dog off for the day of grooming– and this is convenient for most people. Finally, groomers do “the dirty work.” If clipping toenails, removing ticks, or cleaning areas that grosses you out, give your dog to the groomer and let them do that stuff. In general, it makes sense to bring your dog to a professional groomer like D’Tails once a month. To make an appointment, please call 706-731-0089 today.